Versatility is the man’s middle name but to the public he goes as Dilip Prabhavalkar. I grew up watching his Marathi movies, television serials and dramas, and was entertained by his comedic timing and his liquid ability to fit the mould of any character he had to play. Dilip Prabhavalkar has acted in Hindi and Telugu cinema as well, thus adding to his repertoire of films beyond a regional language. One of India’s finest actors, Prabhavalkar is renowned for his roles as Nandu in the critically acclaimed Chaukat Raja and the spirit of M K Gandhi in the Bollywood blockbuster Lage Raho Munna Bhai. It was an uncharacteristic career move for someone who had established himself in the field of science. He had never planned to become an actor. Along with a Master of Science in biophysics, Prabhavalkar had a diploma from Bhabha Atomic Research Centre, Mumbai. Although he had been doing theatre work on the side by performing in children’s plays and experimental theatre at Chhabildas, Mumbai, acting was just a hobby. His ambition was to become part of the Tata Institute of Fundamental Research, Mumbai, and conduct research in molecular physics. A dearth of vacancies forced him into working in the pharmaceutical business as a chemist. In time his interest and participation in theatre increased. His first prominent role was in playwright Vijay Tendulkar’s Lobh Nasava Hi Vinanti, but it was only in 1991 that he decided to take up acting as his main occupation. Being part of the children’s and amateur theatre brought him in contact with Ratnakar Matkari’s troupe and he acted in all the plays put on by them. Of his roles with this troupe, his most renowned one is that of the witch in the children’s play Albatya Galbatya. ‘The process of finding myself began with performing with Matkari. I got to do a variety of roles there…Here I played my first role as a woman,’ says Prabhavalkar, who went on to play female roles as the mother-in-law in the play Vasuchi Sasu and as Dipti Prabhavalkar Patel Lumumba in Hasvaphasvi, a play written by Prabhavalkar himself. His performance as a witch was so convincing that the children who had come to watch the play became afraid and Prabhavalkar heard some of them whispering that they wanted to go home. Despite their fear the allure of his acting was enough to keep the children glued to their seats to find out what the witch would do next. ‘Most of the people there did not realise that I was a man and asked Matkari where he had found such a tall woman to do the role of the witch,’ says Prabhavalkar. ‘I became so comfortable in playing the character that at the end of a day of shooting it would be difficult to find Dilip Prabhavalkar in myself,’ says the thespian who enjoyed playing Chimanrao more than any other role in his career. As an actor, Dilip Prabhavalkar has donned varied types of make-up and costumes from false teeth to sarees. This has been owing to the demand of the role rather than for the sake of gimmickry. In contrast, he has done roles that have required minimal make-up too. Preparation for some roles, such as Gandhi and Nandu (Chaukat Raja), has entailed much research and work, while others like Gangadhar Tipre, from the serial Shriyut Gangadhar Tipre, have hardly needed much study for him to get into the skin of the character. As Nandu in Chaukat Raja, Prabhavalkar met with children at an institute for the mentally retarded to establish the empathic bond and to study mannerisms which were necessary to act the part of a mentally slow individual. Prabhavalkar was meant to have played the part of Smita Talwalkar’s husband but was roped in to act as Nandu because Paresh Rawal, who was to do the role, pulled out of the film. He surmises that the pressure of doing a role he was not prepared for hastened the flow of his creative juices. 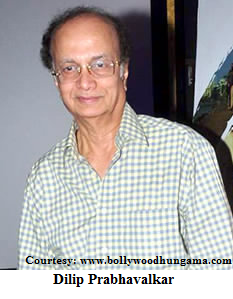 The winner of numerous awards for acting, Prabhavalkar has the Maharashtra State Award to his credit for Chaukat Raja. Apart from acting, the skilled humourist has written books such as Googly and Hasgat which have won literary awards. The celebrated actor believes in giving back to society what he has received in abundance. He is associated with Kamayani, an institute that works with mentally retarded children. This is a connection he formed while working on Chaukat Raja. He has also lent his voice to create audio cassettes for the Poona Blind Men’s Association’s ‘Talking Book Libraries’.